8 Dome Camera System featuring 700TV Line Resolution Vandal Proof and Weather Proof Dome Cameras that have a manually adjustable 2.8-12mm Lens, and D1 resolution recording Digital Video Recorder with 500GB of hard disk space for 3 weeks of continuous video recording. The dome cameras in this system are fixed cameras that when mounted on a wall or ceiling, and with the lens adjusted for your desired viewing angle, will keep looking in that direction. 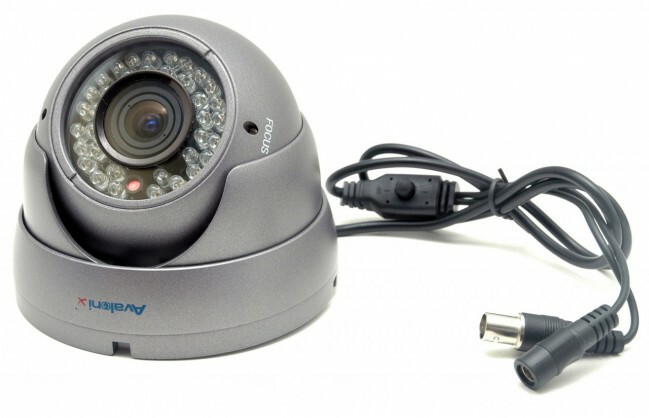 They provide the highest resolution available currently in the CCTV Camera industry, that's 700 Lines of Resolution. The cameras feature a SONY CCD with a SONY Effio-E image processor to offer you the clearest image possible with a CCTV camera. You can rest assured that once mounted, the cameras are difficult to remove or manipulate by passersby, making them ideal for situations where you expect the cameras to be in reach of people. These cameras are made out of metal and are weather proof and water proof with a IP66 rating, meaning they will withstand heavy rain, snow, sleet, and hot or cold temperature. Don't worry about frigid or subzero temps with these cameras. They will last in almost all types of weather. They also offer 36 High Intensity infrared LEDs for night vision up to 100ft from the camera in total darkness, and farther in low lighting. When set to the widest viewing angle of 90 degrees at 2.8mm, you can expect to get a person's face up to 25ft away. At the 12mm mark which gives you a 20 degree viewing angle, you can ID a stranger's face up to 60ft away from the camera. Of course at any angle, the cameras can see up to infinity just like the human eye. The DVR Recorder included in this system comes with a variety of features, all of which are very user friendly for configuring. With this unit you can fully customize recording schedules, resolutions of recording for each camera, and it features fully customizable motion detection areas as well. 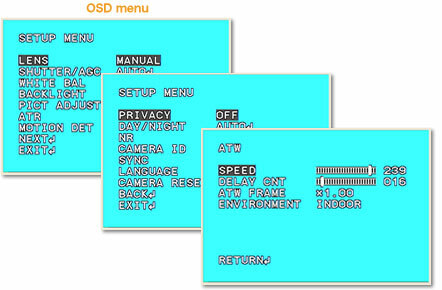 Using the on-screen display menu, you can easily set which areas of the camera you want motion detection, and which areas you do not - this is called motion masking. Motion masking is especially useful for environmental movement that may cause unwanted triggering of motion detection. On this DVR, viewing your recorded video is as easy as 123, it has a very user friendly interface, while not compromising advanced features. This DVR also features remote viewing, not only from a web-browser anywhere with an internet connection, but from most Smartphones and tablet devices as well. Imagine being able to pull up your cameras with the ease of opening an app on your phone. Email notification can be set as well, so the DVR can send you a email notification that motion occurred on a particular camera. If you want to get really complex you can even set the DVR to upload video to a remote NAS or FTP server for keeping live video backups.